For visitors not wanting to hire a car at Malaga airport or depend on the bus or train, have you considered the Malaga airport transfers? It can be a fast and comfortable option. You don't need to worry about orientation in the streets or parking your vehicle, you lean back in your comfortable seat and enjoy the views over the Mediterranean Sea while your bilingual chauffeur takes you swiftly to your destination. This option is also very attractive for more secluded resorts that do not have a good public transport, such as the Golf hotels and more exclusive resorts located in the interior. 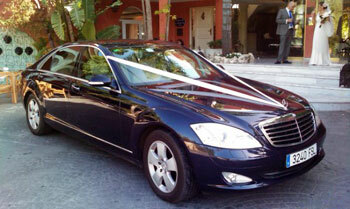 Our service is also available for outings, excursions and weddings. Taxi transfers are always reliable and leave you directly at the airport, which is especially important when you are in a hurry and do not want to miss your flight. Although in Spain the regulation does not require the use of child seats in non-private vehicles, you can and we recommend that you ask for it when making your reservation. The most important thing is that children travel safely and with Malaga airport transfers you can do it. There are numerous taxi websites, some offer the option of payment on arrival and others offer prepayment. As they are fully regulated companies it is safe to make payment online, so the final decision is up to you. Offers online payment, pays once and have peace of mind. English website and a direct service without intermediaries, they are not brokers. Offers payment on arrival, no need to make online payment or enter your credit card details. Website in English and offers a direct service without intermediaries. An airport transfer is a single final price. The price is usually cheap when using a transfer. You can reserve the vehicle model that best suits your needs. When booking a private taxi you can choose a minibus with capacity for 8/19 passengers or even a bus with capacity for 20/54 passengers, depending on the number of people travelling or the amount of luggage. Transfer driver will provide you with assistance in English and Spanish. A transfer will be at the time and place indicated, without waiting and with a pre-set price. Transfer offers you the possibility to book baby seats in advance. If wondering about what would be better for your transport in Malaga if a comfortable transfer or a cheap car rental It depends on you. If you plan to use a vehicle for more than a round-trip from and to the airport you might be interested in checking our prices for car hire at Malaga airport. Our prices are very competitive and you will have your own vehicle for getting the most from your vacation.